Stacking bracelets is a trendy way to wear women’s accessories. 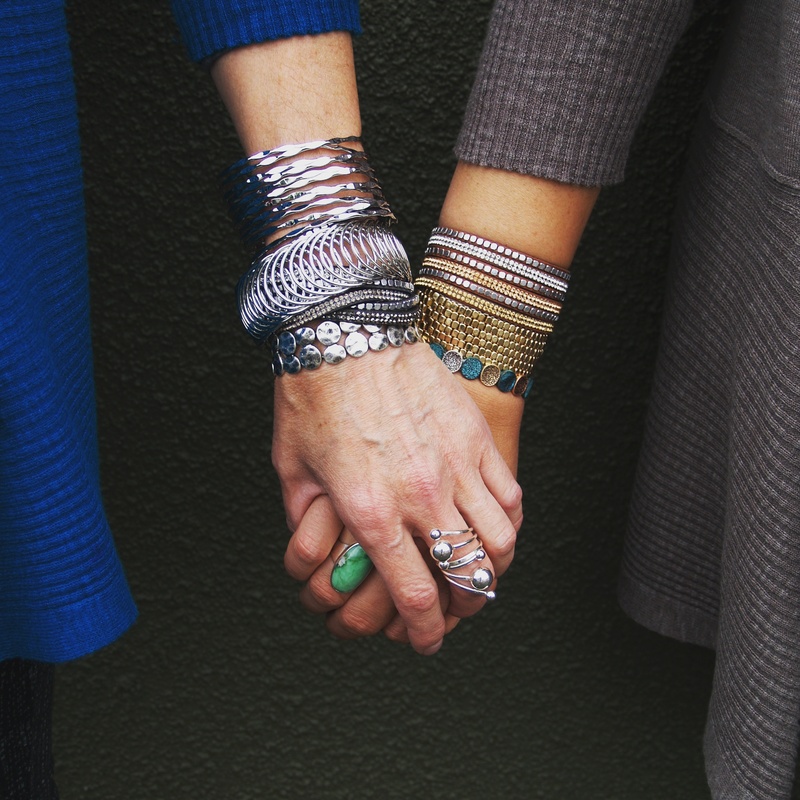 There are no strict rules for stacking and styling bangles, but we do have some tips to make the biggest statement and represent your unique style. For anyone just starting to experiment with the stacked look, we recommend sticking with a monochromatic color palette or smaller sized jewelry to make this trend less intimidating. Try three or four bracelets on one wrist with each one sharing a similar characteristic such as material or color. For example, try several different gold bangles that share a similar style. Or, choose bracelets of different styles, each one having a single color in common like turquoise jewels or silver finishes. If you have a more bold and adventurous look, then forget the traditional rules and have fun mixing jewelry colors and metals. Today’s hottest looks are all about variety, so you can pull extensively from your entire collection of women’s accessories when choosing the day’s bling. Don’t forget to mix up widths, too. We think there’s something so eye-catching about a wrist full of bracelets that include cuffs, bangles, leather, and chains. We like to mix up the stacked and layered look with a few special pieces. Adding a watch with an oversized face is one way to mix up the finished result of the jewelry. You could also coordinate rings with the bracelets for a polished effect. Wearing multiple rings on a single finger is gaining traction with many women right now, too. Plus, a fun nail color can also add a finishing touch. Coordinate nail polish with gemstone color or leather band hues to tie it all together. Individuality and creativity are such a deep part of Portland culture, and it’s possible to allow each woman’s innate personality and style to flow freely through clothing and women’s accessories. We say forget about conforming to rules and let your colors and combinations shout to the world.